17 May 2007 (The Epoch Times) – A travel piece on the My Son Sanctuary in central Vietnam, once the spiritual centre of the Champa kingdom. In a lush green valley in central Vietnam under the imposing glare of Cat’s Tooth Mountain rests one of the most important archaeological sites of the ancient kingdom of Champa. It is unassuming, resilient and rich in history and beauty. One could well be describing Vietnam itself. 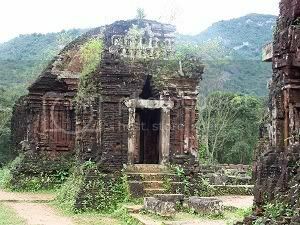 In truth, the crumbling temples of My Son are just a speck on Vietnam’s kaleidoscope of indulgent cultural experiences. But to walk through the secluded sanctuary of My Son, where the ancient monuments still stand proudly among the suffocating tropical growth, clear running streams and thick scent of surrounding coffee plantations, is a true test of the sensory overload that must be endured by all visitors to Vietnam. My Son may not be one of the country’s most well-known attractions, but it can be one of its most rewarding. It is highly atmospheric, dramatic and dripping, not only in tropical humidity, but also the ancient spirit and architecture of Indian Hinduism blended into a typical South-East Asian terrain.